Have you ever felt a void inside you regarding a perfect software that could manage all your images, scale them to the format that is web safe but at the same time no loss of the image quality so that you can upload them onto your websites with ease? If Yes, then we got you all covered today as we will be revealing the impressive solution to all these problems by removing the veil that has been put on it. jAlbum is the software which will resolve all your image related queries. You can now finally be rest assured regarding the organization of your images or converting them to specific resolutions and optimizing them so that they look terrific and eye catchy so that your blog, website or any social platform on which you put those images or your image galleries, they stand out, and the graph of your platform’s popularity vs. the Audience base climbs up to a new peak. Now before we get into the details of the magic software jAlbum, let’s have a cursory look as to what jAlbum is and why so many users are going gaga over this software. jalbum is a shareware software that is designed for all the major platforms, mainly we can call it as platform independent. This main functionality of the software is to manage all your photos and help you create stunning, excellent and optimized photo Galleries. It is a kind of a powerful image editor with a lot of features that help you in your quest to boost the quality of your images. With jAlbum, you can create stunning digital image galleries which will be entirely suitable for your web pages. One of the best features of the gallery making function of jAlbum is that using the software you can scale the images to a web-specific format. Most of the pictures on display on the images get pixelated as soon as a particular user uploads them on the website. Furthermore, the sites also show a lag whenever a large-sized image is uploaded to it. 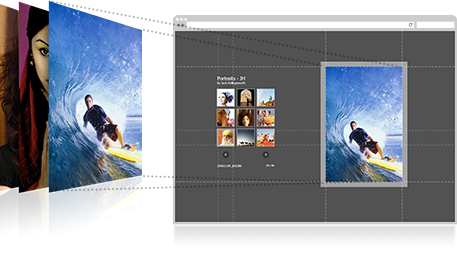 Using jAlbum, you can now create visually appealing digital galleries using your big sized photos. The result would be correctly scaled, top quality images with a crisp display. 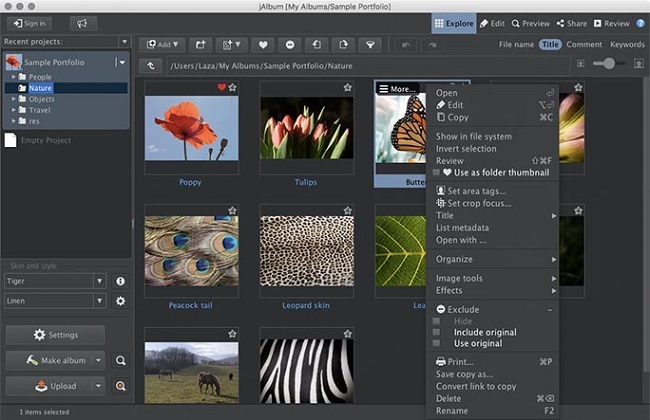 Another significant advantage to using jAlbum is the availability of a plethora of skins which the user can use to meet their requirements of making digital galleries. You can find a lot of pre-defined skins available for download on the official website of jAlbum www.jalbum.net. Most of the skins are available to download without any cost. However, a few of them do impose a specific minimal cost. But that would be indeed a perfect investment. To have a better understanding of how the use of skins can serve as an asset for your digital gallery or any online platform which you are currently working on, you can have a look at the following two beautiful sample galleries. The User-interface of jAlbum is quite convenient and easy to use. 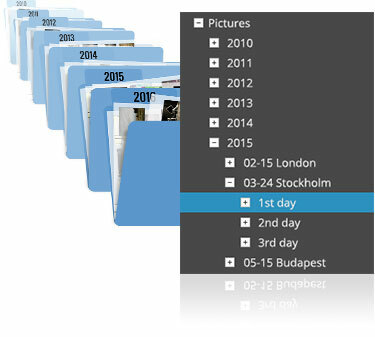 You can drag and drop the images into the jAlbum explorer, and all your pictures will be copied onto the clipboard of the software, and then you can carry on with optimizing or organizing your images. 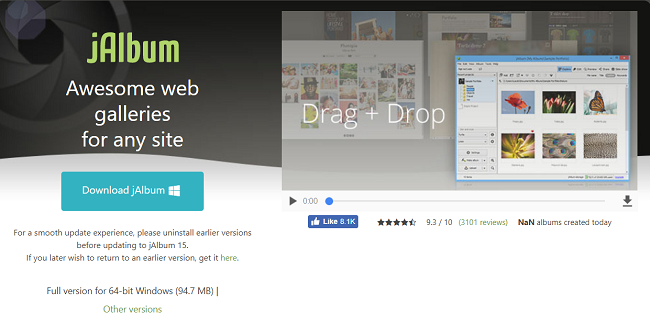 jAlbum supports a vast web album, and the user can upload a large number of images on their jAlbum album which can serve as a database for their digital library. Most other software programs offering such functionalities do not provide such large database sizes to store their images. An average jAlbum gallery can be expected to have around 80 pictures but as large as 10000 images have found to be in many jAlbum galleries. As an example, you can have a look at the following image gallery, especially the GEOART gallery which has around 4000 images in its gallery. You can find link to the gallery here. 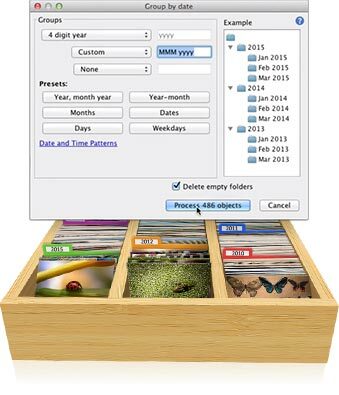 jAlbum also offers a powerful file organizer which allows you to organize images based on various categories like year-wise, month-wise, week-wise and many other such sub-categories. jAlbum quickly organizes the photos based on the date the photo was taken or modified, the location tagged with the image or the based on the name of the image. 1. Trustpilot – Trust pilot has collected around 3092 reviews so far, and the final verdict regarding the software based on the reviews posted on the website makes jAlbum as an excellent choice and a thoroughly reliable and powerful photo gallery making and organizing tool. 70% of the users have rated it five stars, and around 22% have rated it 4 stars from a total of about 3100. 2. Majestic.com – According to this website, jAlbum has been successful in generating a humongous web presence with around 100 million web pages made with the aid of this software. This is a massive accomplishment for a software. 3. download.cnet.com – On this website too jAlbum has been rated 4.4/5 From a total of around 166 votes. Majority of the users have rated it as excellent with only a few deviating towards very good. Well, after having listed so many facts and figures regarding the robustness of jAlbum, the verdict indeed goes in favor of recommending jAlbum as the best photo gallery editing and organizing tool available online. So if you are out there looking for a software which belongs to the fore-mentioned category, then jAlbum is indeed the best choice you could opt for.